What happened when the US government stopped investing in railroads and started investing in highways and air travel? By the late 1970s, six major eastern railroads had declared bankruptcy. Although he didn’t like trains, Howard H. Lewis became the primary lawyer for the Reading Railroad during its legendary bankruptcy case. 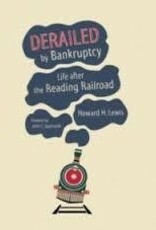 Here, Lewis provides a frank account of the high-intensity litigation and courtroom battles over the US government’s proposal to form Conrail out of the six bankrupt railroads, which meant taking the Reading's property, leaving the railroad to prove its worth. After five grueling years, the case was ultimately settled for $186 million―three times the original offer from the US government―and Lewis became known as a champion defender of both the railroad industry and its assets.